This species is accepted, and its native range is S. Tropical Africa. Perennial; caespitose. Culms slender; 70-130 cm long. Ligule a ciliate membrane. Leaf-blades 14-35 cm long; 3-5 mm wide. Leaf-blade apex acuminate. Inflorescence a panicle. Panicle open; oblong; 7-30 cm long; contracted about secondary branches. Primary panicle branches spreading. Panicle branches glabrous. Spikelets solitary. Fertile spikelets pedicelled. Spikelets comprising 1 basal sterile florets; 1 fertile florets; without rhachilla extension. Spikelets ovate; dorsally compressed; 2-2.5 mm long; falling entire. Glumes similar; reaching apex of florets; thinner than fertile lemma; gaping. Lower glume ovate; 0.5-0.75 length of spikelet; membranous; without keels; 3(-5) -veined. Lower glume apex acuminate. Upper glume ovate; 1 length of spikelet; membranous; without keels; 5 -veined. Upper glume apex acuminate. Basal sterile florets male; with palea. Lemma of lower sterile floret similar to upper glume; ovate; 1 length of spikelet; membranous; 5 -veined; acuminate. Fertile lemma oblong; dorsally compressed; 1.5-2 mm long; indurate; pallid; shiny; without keel. Lemma margins involute. Lemma apex obtuse. Palea involute; indurate. Loosely tufted perennial with slender culms 70–130 cm. high. Leaf laminae 14–35 cm. long and 3–5 mm. wide, linear, acuminate. 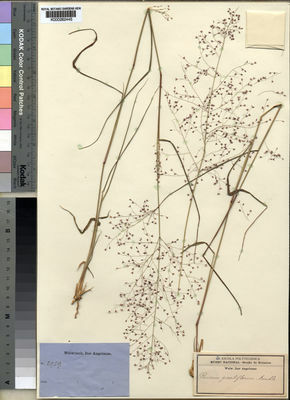 Panicle 7–30 cm. 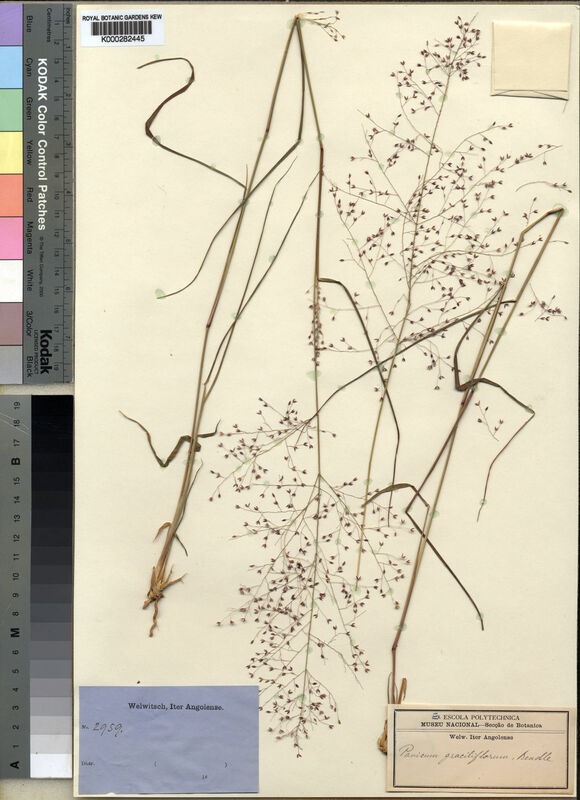 long, ovate-oblong, much branched, the branches fine and spreading with the spikelets evenly distributed. Spikelets 2–2.5 mm. long, ovate; inferior glume 1/3–3/4 the length of the spikelet, 3(5)-nerved, acuminate; superior glume 5-nerved, recurved acuminate; inferior lemma 5-nerved, palea well developed, male; superior lemma glossy.